The Ian Potter Centre in Melbourne’s Federation Square was the location of “Nature Revealed”, the display of over 150 paintings by Eugene von Guerard. The Centre was open from 10am-5pm, 16 April – 7 August 2011. The painter, who was born in Vienna in 1811, began his art training in Italy under Giambattista Bassi and continued it at the Dusseldorf Academy, where he went on painting tours. He was influenced by the German natural scientist Alexander von Humboldt, who viewed art and science as complementary practices, who saw science as able to assist the painter to attain botanical, geological and topographical truth and reality and who accepted the inter-connectedness of all natural phenomena. Eugene arrived in Melbourne in 1852 and headed for the gold-fields. 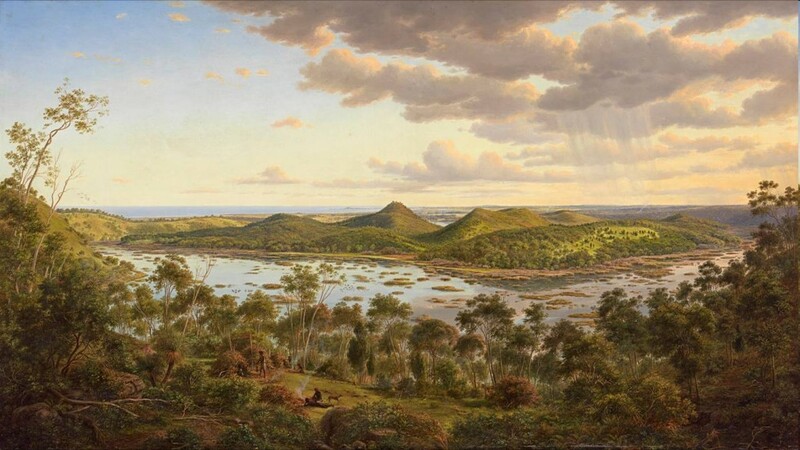 After marrying Louise Arnz in 1854, he went on painting expeditions to the Otway Ranges, the Western District, the Grampians and the Dandenong Ranges in Victoria. After 1862, he also visited Mt Kosiuszko, Tasmania and New Zealand. Impressive features of his paintings are his meticulous brush-strokes and his skill in depicting the landscape so realistically and in microscopic detail. An informative Symposium was held on 30 April on the Scientific Perspectives relating to his landscapes. His expeditions were conducted in the company of other prominent German scientists, such as von Neumayer, who was engaged in his magnetic survey of Victoria. Debate has emerged over whether such scientifically-precise, “photographic” realism can hold the status of art, which tends to foster the subjective, the experiential and the impressionistic. Viewers of von Guerard’s landscapes will see that his realism and precision does not detract but adds to the grandeur and majesty of Nature, as presented in such paintings. Certainly my view of Australia in the 1800s has been enriched by this remarkable exhibition, which has the most appropriate title of “Nature Revealed”.